Story by REDintern Roshan Thomas. Photos by REDintern Jordan Lim. PSOEB Hockey Pitch, Wednesday, March 13, 2019 — St. Andrew’s Secondary School (SAS) ground out a 1-0 victory over Sengkang Secondary School (SKS) to top their second-round group stage. With this result, SAS improves to a 1-0-1 win-draw-loss record, while SKS drops to one of 1-1-0. Both sides have booked a berth in the semi-finals. It was SKS who threatened first, as Syazwi Zufayri Bin Yusri (SKS #17) and Supaya Saran Raj (SKS #10) combined on a fast-break to force the SAS goalkeeper into making a close-range save. Meanwhile, SAS pressed high up the pitch in search of an opener, and this allowed them to win a succession of penalty corners. 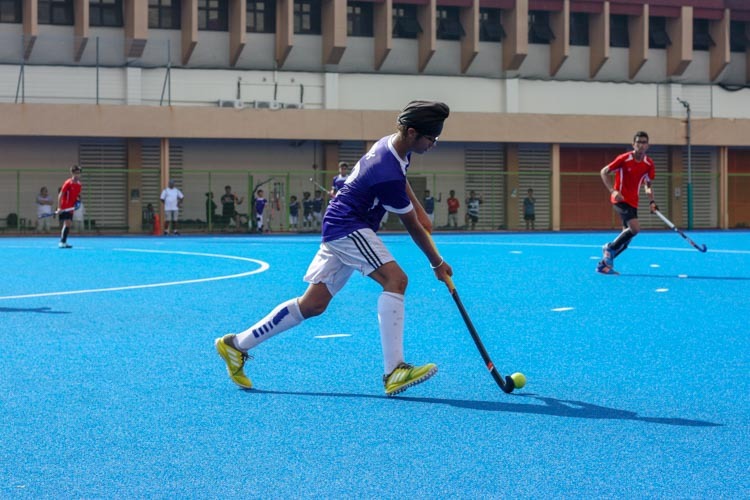 Harek Singh Mehta (SAS #12) came especially close to scoring from a corner as he fired a sweep-shot just wide of the goal-frame. As time ticked on, both sides settled into their own attacking strategies, with SAS holding possession in the final third of the pitch, while SKS relied on counter-attacks. Yet, it was the effort of SAS which eventually paid off as they drew first blood just past the 15th-minute mark. Joshua Eng (SAS #9) had a slap-shot saved by the SKS goalkeeper, yet Mervylen s/o Ramesh (SAS #11) was on hand to slot the rebound under the goalie and into the net. This strike caught SKS off-guard, and they were unable to muster a response to penetrate the SAS defense, and the half closed out at 1-0. As the second-half resumed, instead of sitting on their lead, SAS came charging forward, seeking that vital second goal to seal their victory for good. Jonathan Tan (SAS #18) nearly did just that, as he jinked and slalomed his way past three defenders, before Julian Chung (SKS #27) blocked his shot. Facing the SAS onslaught, SKS needed the calm Dhinagran Nair (SKS #2) to steady the ship and build up attacks with his patient passing strategy. In spite of this, the SAS guard refused to buckle, and led by Nathan Devavaram Theodore (SAS #20), they worked tirelessly to pull out last-ditch tackles. Remarkably, Nathan even showed glimpses of attacking prowess too, as he slammed a tomahawk shot just over the crossbar from a penalty corner. As the the full-time whistle loomed nearer, the desperation for an equalizer grew among the SKS players as they poured numbers forward in attack. SKS won a stream of free-hits around the “D” area, and these presented their best opportunities for drawing level. Dhinagran and Akmal Rifqi B Kamal Rudin (SKS #7) especially stepped up, as they fired a continuous barrage of shots from long-range. These efforts were just barely blocked by the lunging sticks of the frantic SAS defenders. And this battle reached its climax in the final minute, as Raj exposed a gap in the opposing defense, and arrowed a powerful sweep-shot goal-wards. However, it was not to be a heroic ending for SKS as the SAS custodian dived brilliantly to save the ball and keep his team’s lead intact. This sealed an upset 1-0 victory for the brave SAS youths over an SKS side that by no means went down without a fight. Both SKS and SAS will now play in semi-final fixtures with dates and venues to be announced.